Pitching wins championships. That axiom is as old as baseball itself. There was no greater example of that than the 1963 Los Angeles Dodgers, who won 99 games and featured two of the best starting pitchers of all time, Sandy Koufax and Don Drysdale. Koufax’s regular season was one of the greatest: 25 wins, a 1.88 ERA with an unbelievable 306 strikeouts in 311 innings pitched; he won both the Cy Young and MVP Awards. Drysdale won 19. The pitching staff had an impressive 2.88 ERA. The lineup was solid too, featuring Tommy Davis, Willie Davis, Frank Howard, Johnny Roseboro, former Yankee, Bill “Moose” Skowron, and stolen base leader Maury Wills, the starting shortstop. Led by longtime manager Walter Alston, they won the National League by six games over the Cardinals. Their opponents, the vaunted New York Yankees, were defending World Series Champions. They won 104 games, finishing 10 ½ games ahead of the second place White Sox. This would be their fourth World Series in a row, the third time they had done that since 1949. Despite a stacked lineup featuring Mantle and Maris, the Yanks had only hit .252 as a team with Mantle being the only one over .300; though Mickey missed 60 games with a broken foot and torn knee. However, the lineup still featured four players with over twenty home runs. Catcher Elston Howard became the first African American to win the American League MVP award. Yogi Berra, his predecessor, was now a player-coach. They also had a great pitching staff, led by two 20 game winners, future Hall of Famer Whitey Ford, and Jim Bouton, who was just in his second season. Veteran Ralph Terry and 22-year-old Al Downing rounded out the starting staff. Their manager was 44-year-old Ralph Houk, a former player, and WWII veteran, who had spent his entire professional career with the organization. Fans anticipated a classic matchup, like the Series of the 1950s. It would be the eighth time the organizations would meet in the postseason, but the first since the Dodgers left for southern California. It was made for the new television age: gritty New York against sunny Los Angeles. Advertisers were overjoyed. The Commissioner’s office was also thrilled. The two biggest markets in the country would be on live TV. Vin Scully and Mel Allen would call the games for NBC. Headlines the morning of the game declared “Yankee Power vs. Dodger Speed.” New York was a slight favorite. Fans lined up overnight at the entrance to the bleachers. The Brooklyn connections for the Dodgers were still strong. 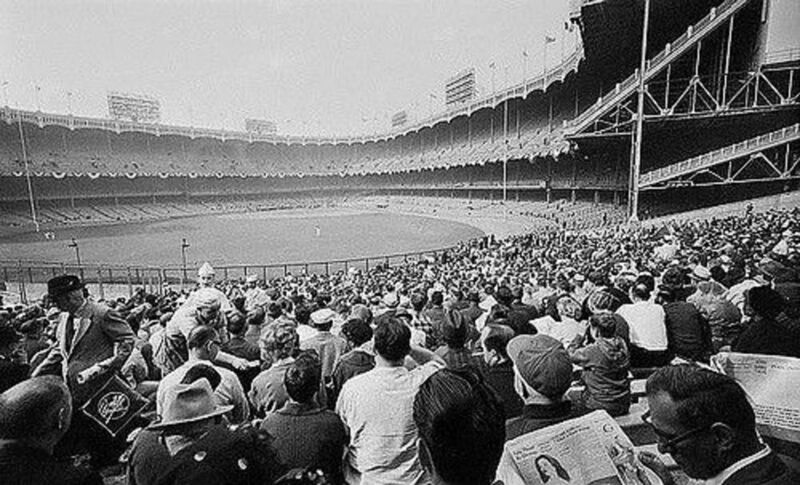 Koufax, Drysdale, Podres, Roseboro, second baseman Jim Gilliam, and utilityman Don Zimmer were left over from the final years at Ebbets Field. 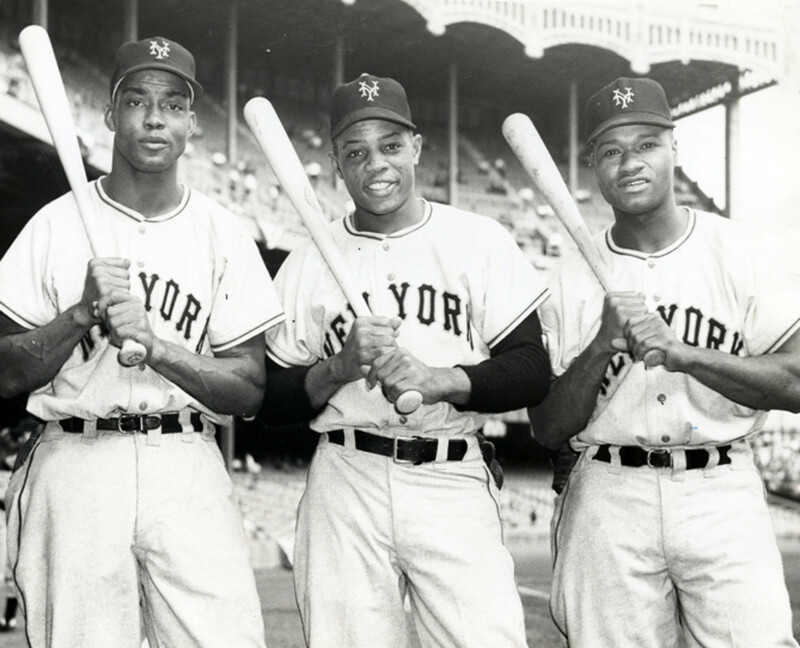 Left fielder Tommy Davis was a Brooklyn native, who graduated from Boys High School. While their fans remained bitter at team owner Walter O’Malley, they still had a fondness for the players. That would result in a lot of cheers for Koufax during Game 1. It was an unusually warm, sunny afternoon to start a World Series. Temperatures hovered near 70 degrees. 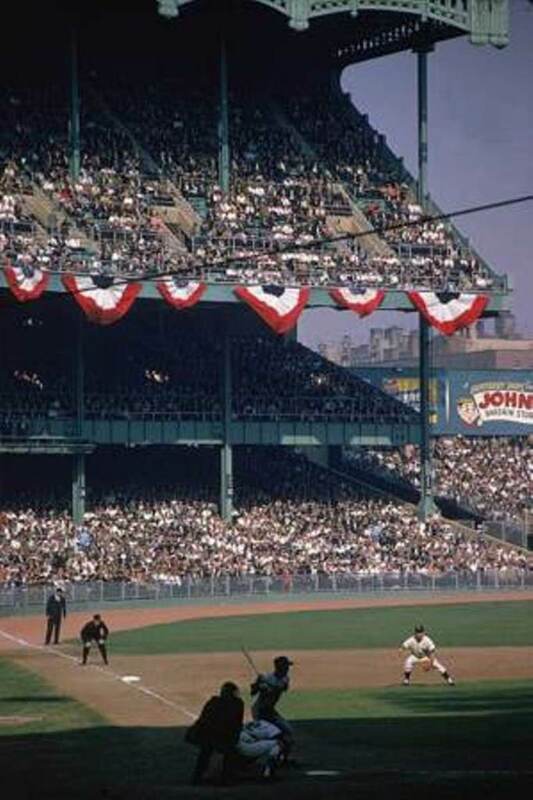 69,000 filled the stands at Yankee Stadium. After player introductions, the National Anthem was sung by Brooklyn-born Elaine Malbin. The ceremonial first pitch was thrown out by the newly retired Stan Musial. Whitey Ford finished his warmups, and leadoff hitter Maury Wills stepped into the batter’s box. The roar of the crowd grew. Home plate umpire Joe Paparella yelled “Play Ball!” and the Series began. 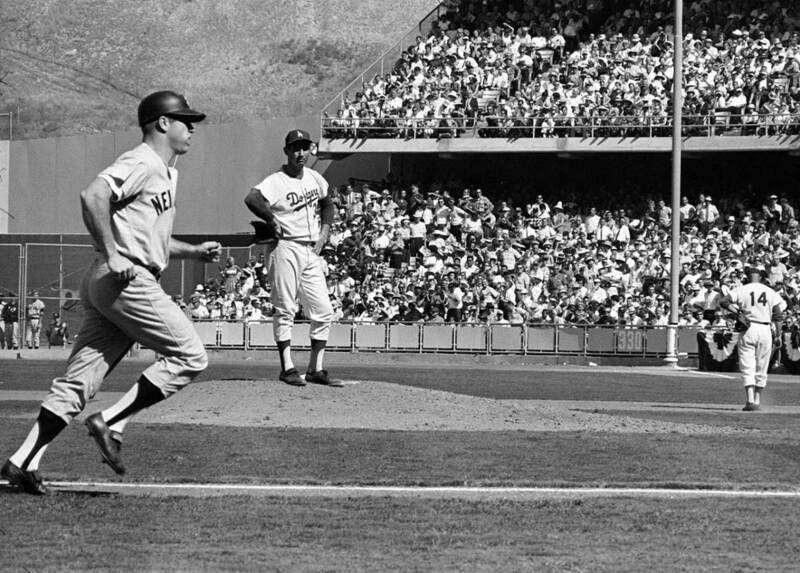 Both Ford and Koufax pitched scoreless first innings. Koufax struck out the side. In the top of the second, the Dodgers scored four runs, including a three-run home run by Roseboro. 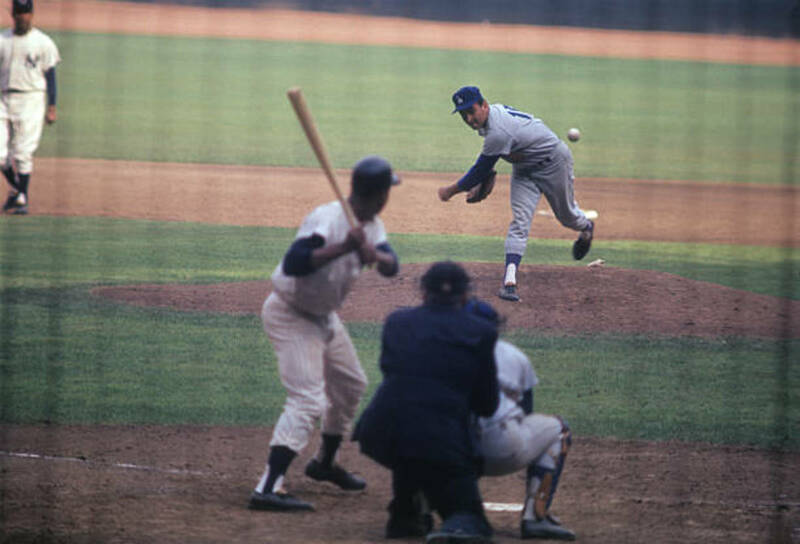 Up 4-0, Koufax picked up where he left off, striking out Mantle and Maris, then getting Elston Howard on a foul pop up. The Dodgers added a run in the third to go up 5-0. Koufax was on cruise control, continuing to hold the Yankees scoreless. He was able to dissipate the only real threat in the fifth inning by striking out pinch-hitter Hector Lopez after the Yankees had loaded the bases. It was his eleventh strikeout of the game and was now in reach of the Series single-game record. The prior record was held by former teammate Carl Erskine, who had struck out 14 Yankees in 1953. Ford was replaced in the sixth by Stan Williams. He had pitched five innings, giving up eight hits and five earned runs, but strikeout four. The Dodgers’ mostly right-handed lineup had been devastating. Frank Howard smashes a double off Whitey Ford in the 2nd inning. Ford called him one of the scariest hitters he ever faced. Note the monuments in center field. They were in play. 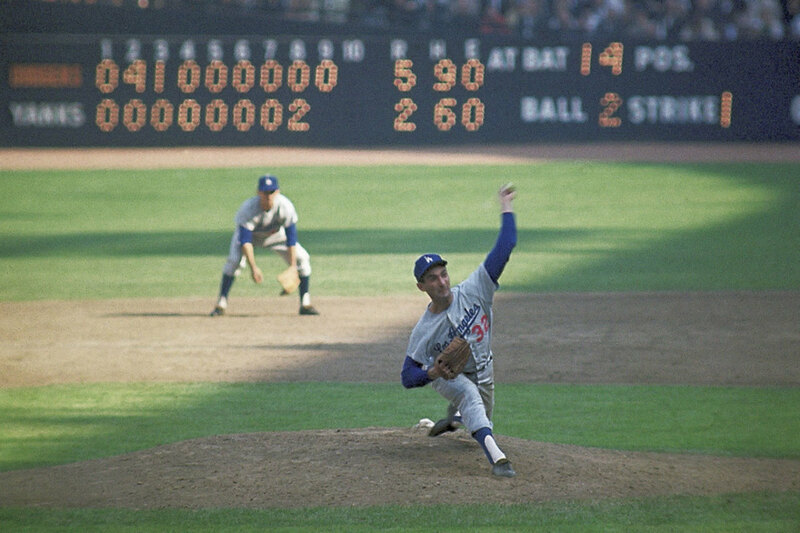 Koufax lost his shutout in the eighth, giving up a single to Tony Kubek and home run to Tom Tresh. As he took the mound for the ninth, he still had a three-run lead and needed only one strikeout for the record. The crowd actually started cheering for the Dodger pitcher. They wanted to see history. Koufax got Elston Howard to line out but gave up a single to Joe Pepitone. The next batter, Clete Boyer, hit a fly ball out to centerfield. The Yankees were down to their last out as pinch hitter Harry Bright stepped up to the plate. The crowd was on its feet. The noise appeared to rattle Bright. After the first pitch strike, it got louder. But then a ball. Bright fouled off the next pitch. With the count 1-2, no one could hear a thing on the field. The capacity crowd was on its feet. Poor Harry felt very alone up there; the whole world seemed to be cheering for his demise. The next pitch was a high, hard fastball which Bright missed for strikeout number fifteen. 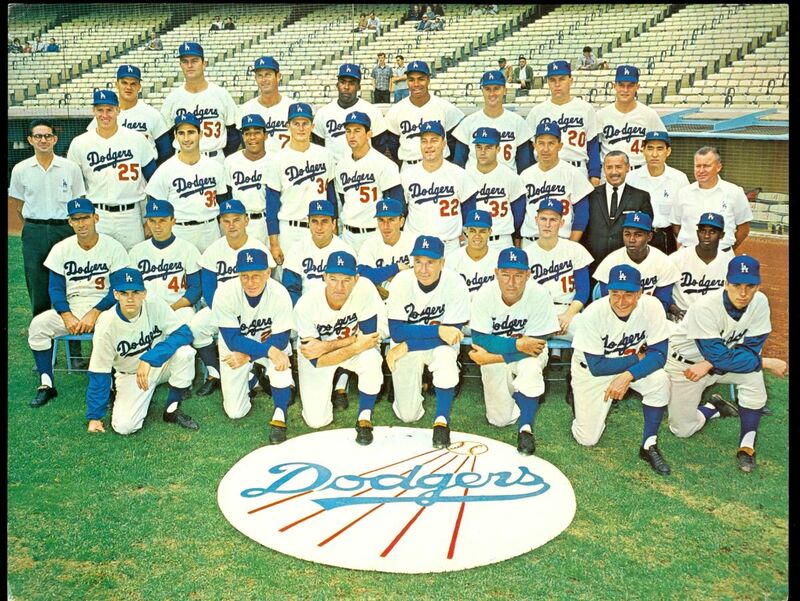 Koufax got the record and was quickly surrounded by well-wishing teammates. From the cheers, nobody would know that the home team lost. A stunned Yankee team retired to their locker room to face a very skeptical group of reporters. To the astonishment of many, it was later revealed that Koufax’s notoriously bad left elbow began to bother him in the 6th inning. The tightening led to the two walks, but he persevered. He told reporters after the game that he was just tired. Pitching Coach Joe Becker confessed to the arm problems, but said Sandy made the adjustment to throw mostly fastballs the rest of the game. Adding to the legend, Walter Alston told the press Koufax had been battling a cold for over a week. Another lefty would take the mound for the Yankees in Game 2, Al Downing. 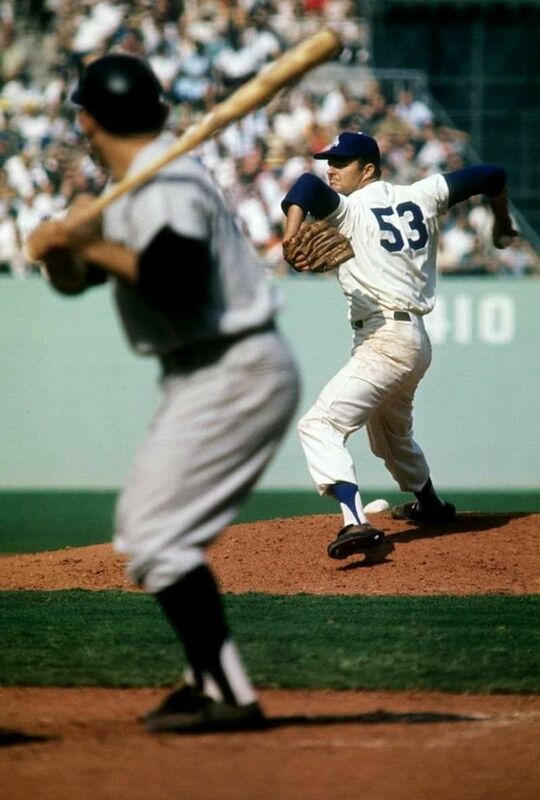 Although technically this was his third season with the Yankees, ’63 was his first full season as a starting pitcher and his first World Series. Los Angeles had 31-year-old Johnny Podres, who was a legend among Dodger fans. 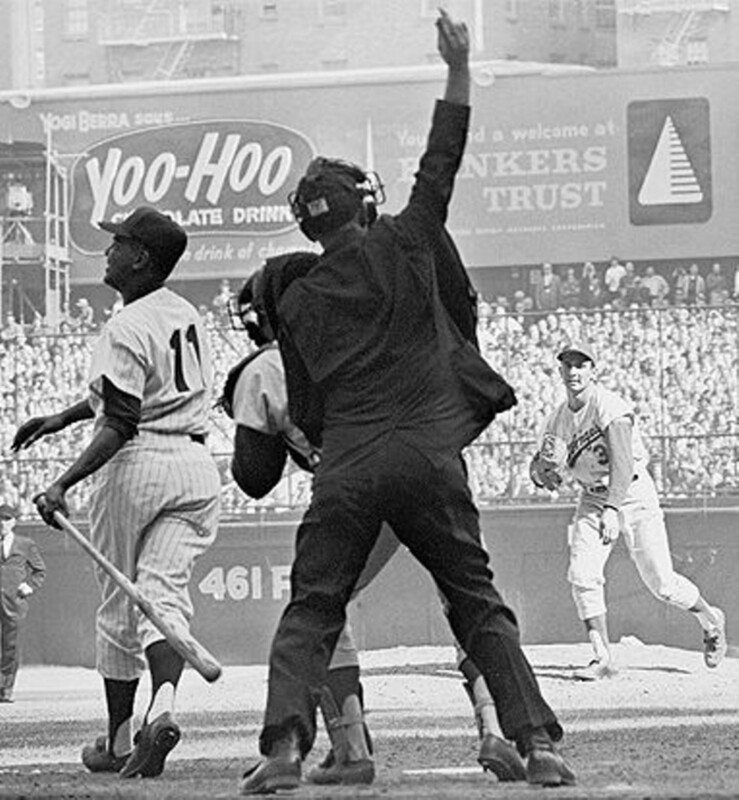 Podres had gotten the last out in the 1955 Series, when Brooklyn finally beat the Yankees. He was 3-1 in World Series games, and this was his fourth Fall Classic. Alston wanted the lefty Podres in Game 2 instead of Drysdale, to counter the short right field porch at Yankee Stadium. The warm fall weather continued, but this time the partly sunny day turned cloudy, with intermittent drizzle by the middle innings. The drizzle turned to rain, making for very slippery conditions in the outfield. Regardless, the 66,000 who filled the Stadium were as loud as the day before; many improvising umbrellas from newspapers and food cartons. The Dodgers once again struck early. Wills led off with a single, stole second. Al Downing had tried to pick him off, but Wills had already broken for second, and Joe Pepitone’s throw was late. Then Jim Gilliam singled to right field. Roger Maris, worried that Wills could score from second, threw home. This let Gilliam advance to second base. Up came Willie Davis, who doubled, driving in both runners. Podres took the mound with a lead and held the Yankees scoreless until the ninth, giving up just five hits. Along the way his teammates got him two more runs, including a home run by Moose Skowron, to take a 4-0 lead into the last inning. The clouds and rain seemed to be another bad omen for the Yankees. Al Downing was relieved by Ralph Terry after the fifth inning. Alston let Podres start the ninth. 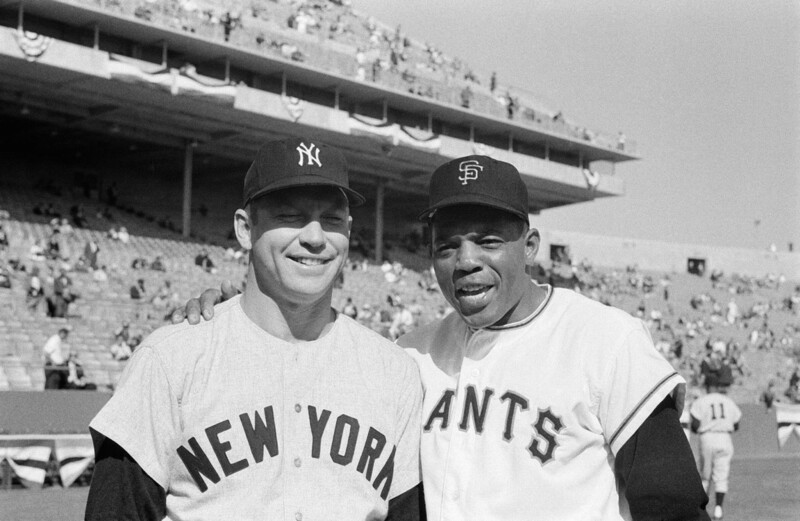 After getting Mickey Mantle to fly out, Podres gave up a double to Hector Lopez, who had replaced Maris. He was then relieved by ace closer Ron Perranoski, who promptly gave up a single to Elston Howard. The shutout was gone. But he rebounded to get Pepitone and Clete Boyer. The Dodgers now took a commanding 2-0 lead as they headed back to Los Angeles. 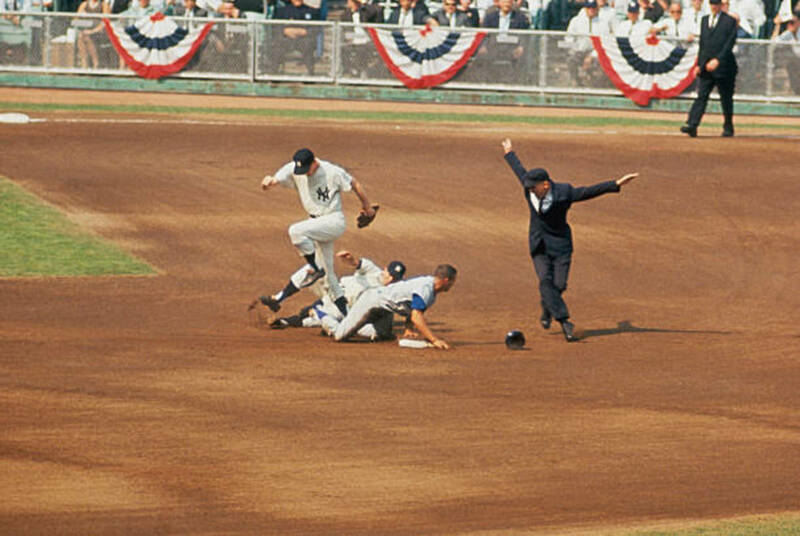 Compounding the loss, Roger Maris got hurt chasing down Tommy Davis’ triple in the third. Davis, a right-handed hitter, hit a weak flyball into the right-field corner. Maris thought he could catch up to it, and kept charging at full speed, but missed the ball. He slammed into the low metal railing, banging his left arm, and leaving a severe contusion. He would not return for the rest of the Series. Both games had been a disaster for the Yankees. Mantle remained hitless. The Yankees were 2 for 11 with runners in scoring position and left 14 men on base. They lost their starting right fielder and had yet to face Don Drysdale. But a young ace would step up and pitch the game of his life, trying to salvage both the Series and Yankee pride. 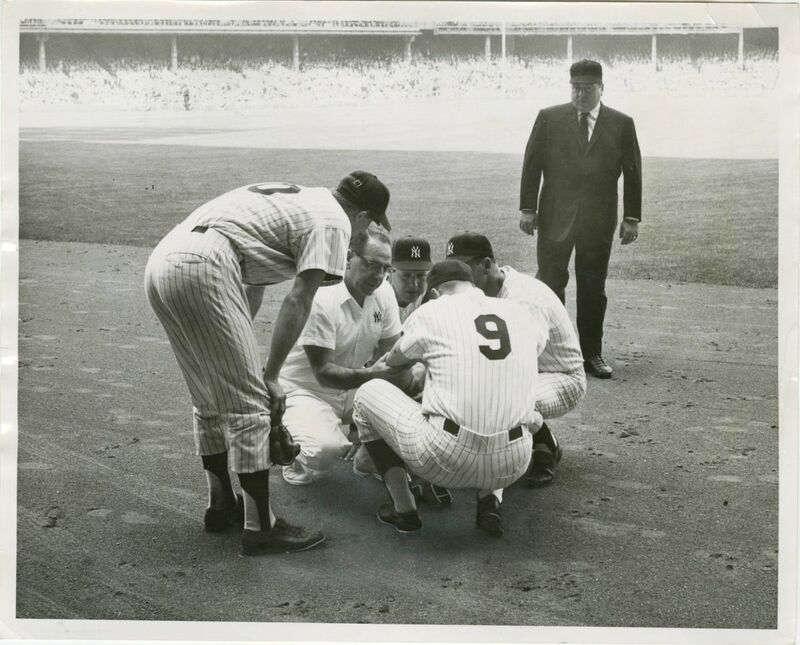 3rd inning, Game 2: Roger Maris is being checked out by the trainer and Houk. Joe Pepitone and umpire John Rice look on. It was do or die time for the Yankees. Twenty-four-year-old Jim Bouton, having won 21 games during the regular season, had everything riding on his right arm. When reporters had asked Bouton after Game 2 what he thought of the Dodgers, he was honest. Without hesitation, he said, “I’ve learned a few things, but nothing that’s eased my mind.” After the reporters pressed him, he did admit to sleepless nights. But he would more than keep up with his fellow All-Star. Walter Alston had saved his right-handed ace Drysdale for Dodger Stadium, and he would not be disappointed. Sunny Southern California lived up to its reputation, with cloudless skies and highs in the mid-70s at game time. 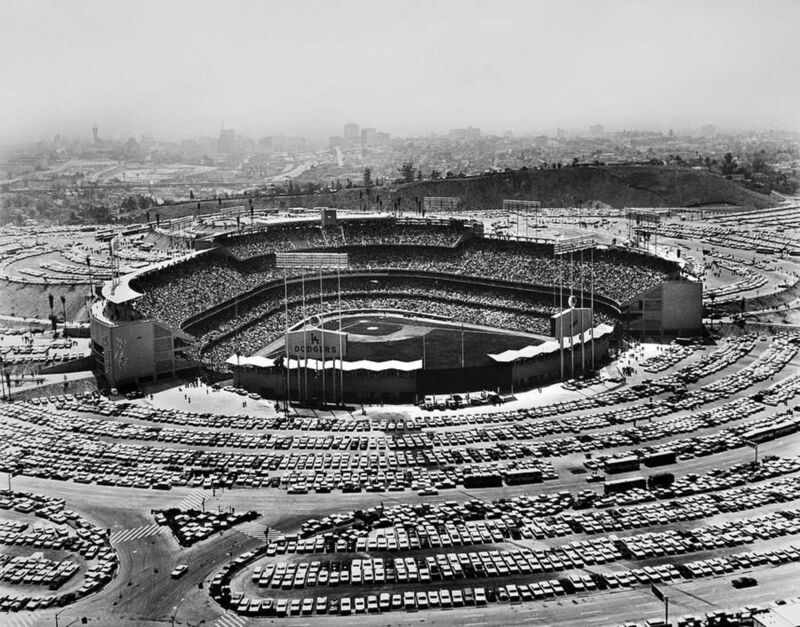 Almost 56,000 filled Dodger Stadium. The crowd was as loud as New York. Drysdale got the Yankees in order in the top half of the 1st, but Bouton struggled in his half of the inning. Surprisingly, he got Maury Wills to groundout but walked Jim Gilliam. Then, after Willie Davis lined out to right, he threw a wild pitch to Tommy Davis and let Gilliam go to second base. Davis, who had just won his second consecutive National League batting title, promptly singled, driving in Gilliam for a 1-0 lead. Mantle would lead off the second. Desperate for a hit, he tried a drag bunt and ended up with his first hit of the Series. A surprised Drysdale then hit Joe Pepitone. But he struck out Elston Howard and got Johnny Blanchard on a groundout. So with two out and first base open, he intentionally walked Clete Boyer to load the bases. Unfortunately, Jim Bouton was unable to help himself and struck out. It was the closest they would come to scoring. Bouton had one more shaky inning in the second, with a wild pitch and a walk to Drysdale. But he held the Dodgers scoreless the rest of the way. It was a solid outing with just four hits and four strikeouts; just not enough. He was relieved by Hal Reef in the eighth. Both teams struggled at the plate. The Dodgers went 1 for 6 with runners in scoring position, while the Yankees went 0 for 5. Drysdale would give up just two more hits, both to Tony Kubek, who would reach first base three times that day. He had also reached on an error in the third, but Drysdale quickly picked him off. It was a three-hit masterpiece. He struck out nine (four looking) and pitched the second complete game of the Series. A visibility relieved Drysdale was mobbed by his teammates after the game. The raucous crowd went wild. 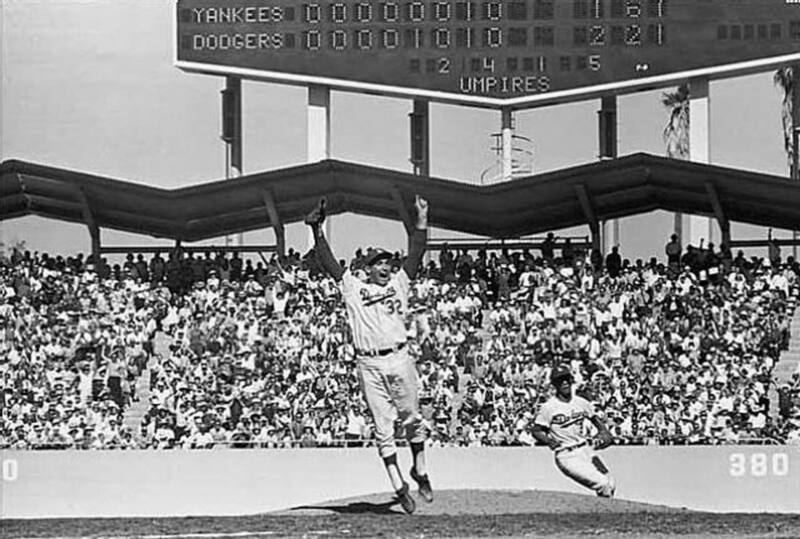 Up 3-0, they now anticipated a coronation the next day; Koufax was taking the mound. Another capacity crowd greeted the teams for Game 4 as anticipation filled the air. The Dodgers took the field to a deafening roar. Eddie Fisher, who would become more famous for his wives and offspring, sang the National Anthem. Game 4 was a rematch between Ford and Koufax. It would be a true pitchers’ duel, and in a cruel twist, the Yankees would out hit the Dodgers. The game was scoreless until the top of the 5th, when Frank Howard took Ford deep to left field for a 1-0 lead. It seemed as though the Yankees couldn’t buy a run. But then in the 7th, Mickey Mantle, who had been 1-13 in the Series, finally belted a home run off Koufax to tie the game. It was his fifteenth in a World Series, which tied Babe Ruth. The lead would not last as the Dodgers manufactured a run in the bottom of the inning. Jim Gilliam lead off the inning and grounded a ball to third base. But Boyer’s throw was lost by Pepitone. Boyer’s high arcing throw was completely enveloped by a sea of white shirts behind third base. The ball hit the heel of Pepitone’s glove and went into right field. Gilliam didn’t stop until he reached third. Willie Davis then got him home on a sacrifice fly. That was all the Dodgers needed. The Yankees would leave five on base and were 0-3 with runners in scoring position; a miserable day. 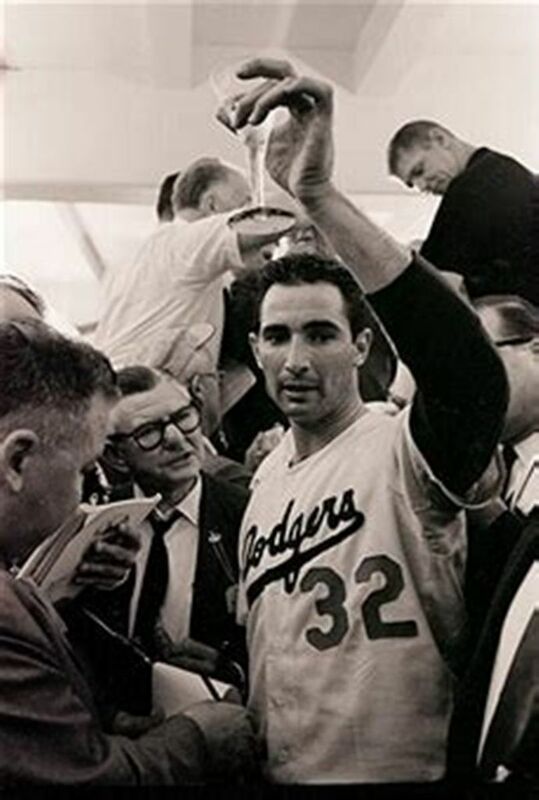 Although they would threaten in the ninth, Koufax managed to get the complete game and a third World Series Championship for the organization. 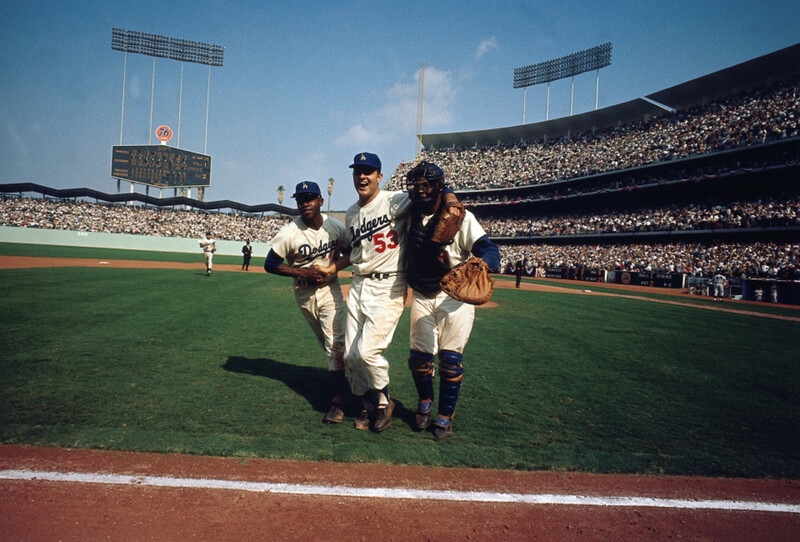 The usually reserved Koufax leapt for joy as he greeted Johnny Roseboro at the pitcher’s mound. The team mobbed Sandy. For the historic performance, he received the Series Most Valuable Player Award. He had pitched two complete games, struck out 23 with just 3 walks. Both teams were historically bad at the plate. The Yankees hit .171 and struck out 37 times. The Dodgers barely broke the Mendoza Line with a paltry .214 while 25 went down on strikes. But they won, and it was the first time they swept an opponent, while it was only the second time the Yankees had gotten swept. In many ways, this series was a sign of things to come for Mantle’s Yankees. A visibly ailing Mickey was only getting worse. Yogi retired and became manager the following year. Although they would get back to the World Series in ’64 against the Cardinals, they would lose again. The organization started shuffling managers. 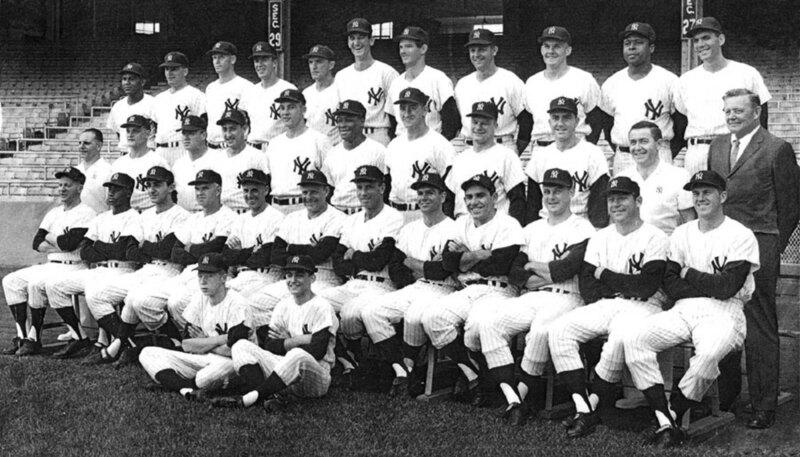 Combined with a weak farm system, the Yankees reached rock bottom by 1966 with their worst record in 60 years. 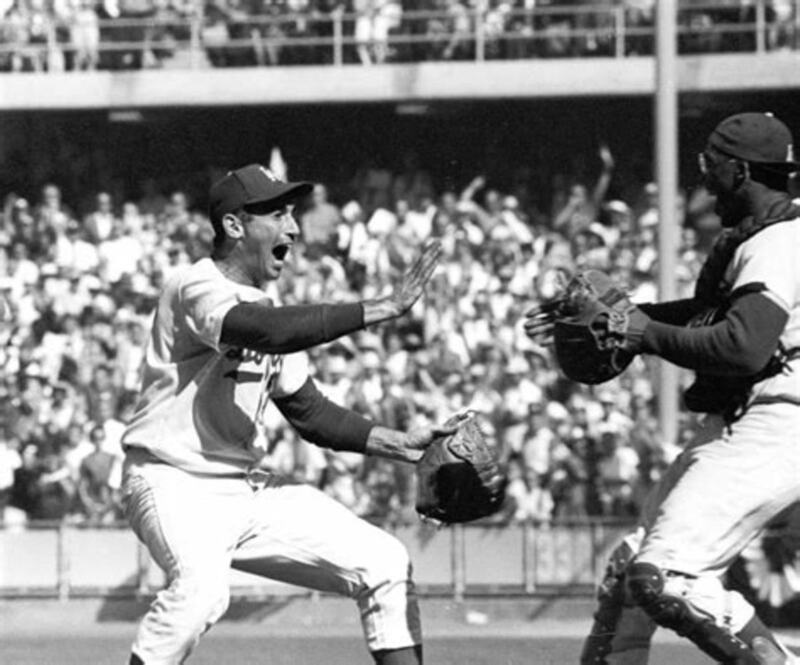 The Dodgers continued to be one of the best teams in the National League, winning the World Series again in ’65 and reaching another the following year. Koufax and Drysdale continued their dominance. But by 1966, Sandy’s arthritic elbow had worsened and made throwing a baseball a miserable experience. He was forced to retire at 30 years old. Drysdale would set a record of his own in 1968 with 58 2/3 consecutive scoreless innings along with six shutouts. The teams have not met in a World Series since 1981. The Yankees hold an 8-3 Series edge. The legacy of the two organizations is undeniable. More than two dozen Hall of Famers from both teams have been inducted since 1950, which includes players, managers, executives, broadcasters and Water O'Malley. In today's media environment, a matchup of the two biggest markets on baseball's biggest stage would saturate the digital world in a wave of trash talk and nostalgia. Hopefully, it happens soon. 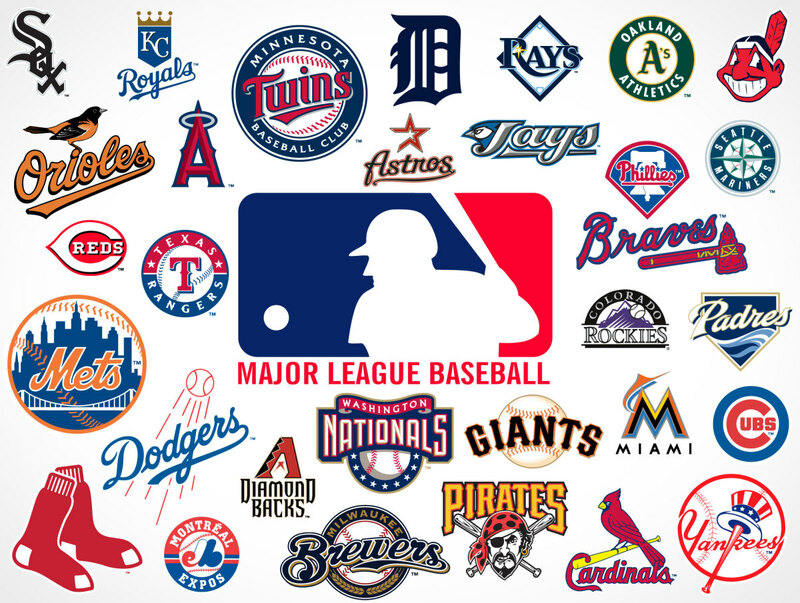 Major League Baseball needs it. During Game 1, Wall Street volume fell to record lows as traders watched the nearest TV and others played hooky. The average game duration for the Series was slightly under two hours. In 2017, it was just over 4 hours. The pitcher’s mound was five inches higher. It was not lowered until 1969. Koufax’s strikeout record would be broken by Bob Gibson the next year. 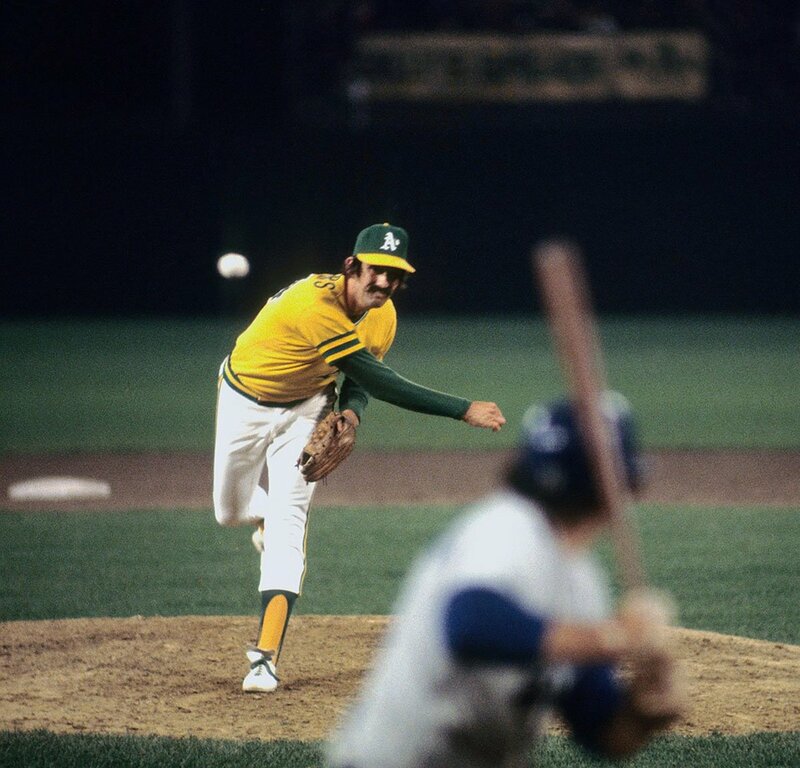 Al Downing, the losing pitcher in Game 2, would give up Hank Aaron’s 715th homer in 1974. “A Greater Love Hath No Fan Than One Who Endureth Rain.” New York Times, October 4, 1963: 57 (via King County Public Library System ProQuest Newspapers). Abrams, Al. “Sidelights in Sports.” Pittsburgh Post-Gazette, October 7, 1963: 30 (via Newspapers.com). Bradbury, Will. “Houk’s Plans for Tomorrow: Maris to Play, Yanks to Win.” New York Times October 4, 1963: 57 (via King County Public Library System ProQuest Newspapers). “Bouton Says Dodgers Are Costing Him Sleep.” New York Times, October 4, 1963. pg. 56 (via King County Public Library System ProQuest Historical Newspapers). Facts on World Series. New York Times, October 2, 1963: 65 (via King County Public Library System ProQuest Historical Newspapers). Drebinger, John. 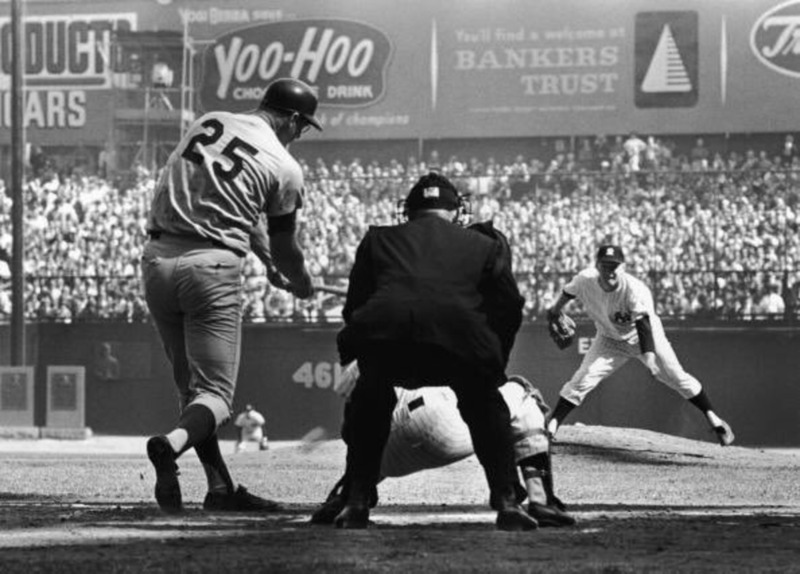 “Strike-Out Mark Is Set By Koufax; Dodgers 5, Yanks 2.” New York Times, October 3, 1963:1. (via King County Public Library System ProQuest Newspapers). Hatter, Lou. “Pepitone’s Muff Costly.” Baltimore Sun, October 7, 1963: 18 (Newspapers.com). Koppett, Leonard. "A Dodger Sweep in Four Games? Podres Says Thereis a Good Chance." New York Times, October 4, 1963: 56. (via King County Public Library System ProQuest Newspapers). Lipsyte, Robert. “Lost: A Small Share of Series Glory.” New York Times, October 3, 1963: 55. (via King County Public Library System ProQuest Newspapers). Maidenberg, H. J. “Bonds: Price Moves Inconclusive in U.S. Government Issues.” New York Times, October 3, 1963: 66. (via King County Public Library System ProQuest Newspapers). Rubin, Bob. “Tall Tale Howard Brings Powerful Presence, and some good Whitey Ford stories, to Yankees as hitting instructor.” Baltimore Sun, April 4, 1991. Baltimore Sun Online Edition (articles.baltimore.sun). Rubin worked for Knight Ridder at the time. Smith, Gene. “Stocks Decline On Low Volume.” New York Times, October 3, 1963: 61. (via King County Public Library System ProQuest Newspapers). Allen, Maury and Markusen, Mark. Yankees World Series Memories. New York: Skyhorse Publishing 2012. Mantle, Mickey and Herskowitz, Mickey. All My Octobers. New York: Harper Perennial 2006 edition (original publication year was 1994).